James has been serving his community in many different ways for the past 15 years. Starting at the age of 16, James began as a volunteer cadet firefighter for Greencares’ Fire Department. While with Greenacres, James obtained his First Responder certification, followed by his EMT certification. After turning 18, James moved into the Coos Bay Fire Department as a cadet in their student residency program. 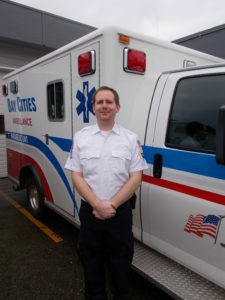 While serving with Coos Bay Fire Department, James was able to obtain his EMT Intermediate certificate, as well as various other certifications for rescue operations. James’ first paid EMT position was with the City of Myrtle Point as an EMT Intermediate. By the time James turned 21, he began working full time for Bay Cities Ambulance and progressed towards earning his paramedic degree. Since becoming a licensed paramedic with Bay Cities Ambulance in 2009, James has continued to advance in his chosen profession, rapidly progressing to Senior Paramedic, Field Training Officer and finally, becoming our organization’s Chief Quality Assurance officer. After 10 years with Bay Cities Ambulance, James says he gets the most satisfaction by training new EMTs and paramedics and empowering them to continue to advance in their chosen career field. Bay Cities Ambulance is proud to nominate James as a 2017 Star of Life.